Lois Selfon will tell you “There are vibrations from Nature that surround us all, everywhere. My hope is to have each careful brushstroke speak to the viewer in the vibrant colors on the canvas”. Lois paints in a mostly abstract “representational” style that allows everyone to find and ponder something different in her work. Born in Brooklyn, raised in Arkansas and Texas, Lois’ most formative memories come from the summer life on her grandfather’s dairy farm. “To a child, farming is a great playground full of magic” she says. Lois experienced first hand the beauty, power and vagaries of the environment in all its forms: weather, plants, assorted animals, crickets and fireflies. Lois says her art always begins with personal observation. Whether philosophical or a form of story-telling I trust that time and continually learning has helped me properly treat each subject with respect. 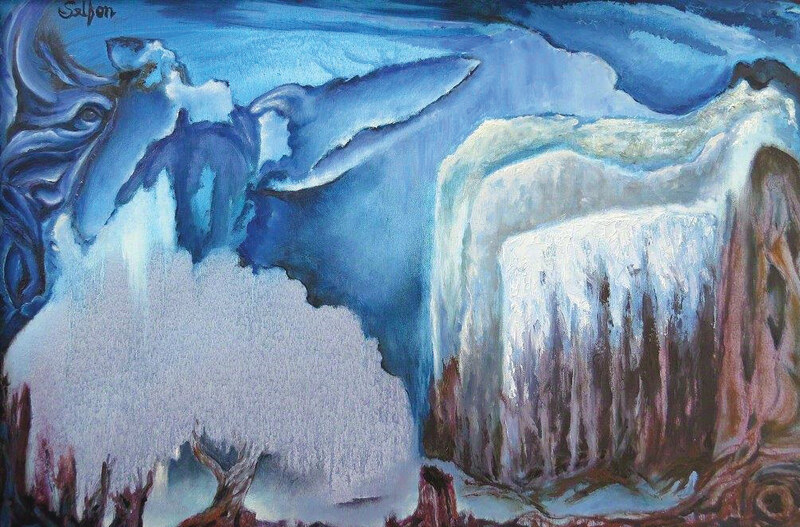 Lois began with watercolors, then transitioned to acrylics. Now she paints primarily in oils enjoying the flow and movement of the medium. Like many artists she roughs out the subject first but, then as she journeys down what she calls the “the rabbit hole”, each work morphs into something drastically different than the original intent. Typically, Lois takes many black and white photos of the work in progress, allowing her to focus on the composition. 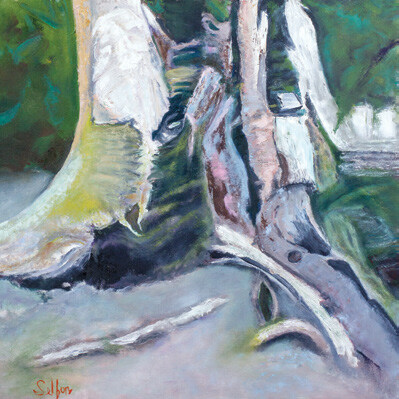 Lois’ art reflects her surroundings around her whether in Naples where she has lived for over twenty years and more recently for the summers in the Smoky Mountains of western North Carolina. 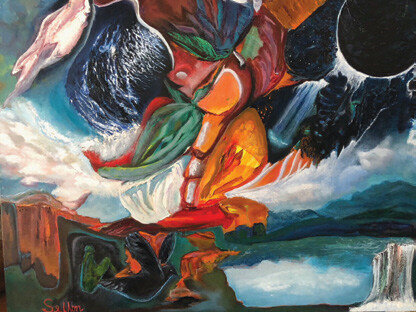 In 2018 Lois had a solo show “Mysteries of Nature” for several months at the Naples Depot Museum. In 2019, Lois will have another solo show “Nature/Schmature: A Co-dependency” at the Sydney and Berne Davis Art Center in Fort Myers. That show will open April 5 until April 28th and will be curated by CesarAguilera, a renowned local artist who also has a singular style. A first for Lois at the Davis Art Center show is that some of the paintings will be for sale. Lois believes that learning is a forever experience. 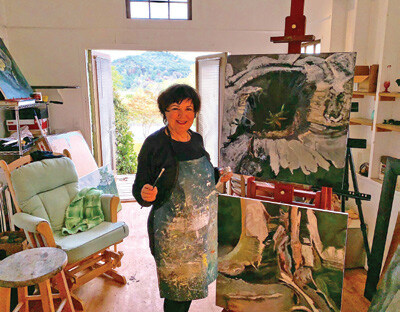 She started painting at a young age and continues to study with artist/teachers in Naples, Santa Fe, Miami, the Smoky Mountains and Washington, D.C.
Lois is a Master Gardener in NC. Here she lives in a replica of one of the oldest cottages (circa 1914) in Old Naples where her gardens, which she personally designed, are renowned. Lois has also been active in the Naples community affairs in many capacities. Lois is not one for the ordinary. One series she is creating for the Davis Art Center show is “Living in Decay” and features the plants and animals that come to life out of decaying matter. To Lois, “The young new life shows Nature always sustains itself. My goal is to reflect this renewal on to canvas”. Love Lois and her art. Can’t wait for Nature/Schmature!